As fans of Entourage know, one of the keys to the show's success is Jeremy Piven's over-the-top portrayal of Ari Gold, the brash, obnoxious, self-absorbed and often-cruel Hollywood super agent. 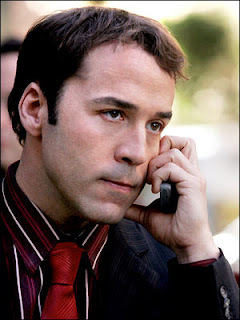 It is also isn't much of a secret that Ari Gold is not-so-loosely based on Ari Emanuel, who plays a brash, obnoxious, self-absorbed and often-cruel Hollywood super agent in real life. Emanuel was such a terror that, the story goes, agency underlings who valued their dignity were afraid to enter Emanuel's sight line -- let alone a room or an elevator he occupied. But ever since Entourage has hit the cable wires insiders have noticed a change in the original Ari's behavior. As one of them put it, "he's mellowed since America found out he's a douche." So there you have it. If you happen to have an unbearable co-worker or relative the best way to cure them is have Jeremy Piven play them in a sitcom. Unfortunately this will not work if you are a co-worker or relative of Piven, who, as a result of his Entourage-fueled ascent from slubby character actor to a pumped up, hair-plugged Hollywood A-minus lister, has reportedly adopted all of the egotistical histrionics of the Ari's, Gold and Emanuel. Art imitating life and then being imitated by life. There's no cure for that.